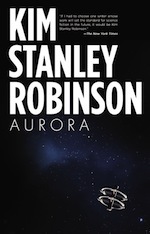 For those who want to have a good introduction to Stan's thoughts and ideas and for those who are already acquainted with his works and are hungry for more, this is a compilation of interviews considered to be Kim Stanley Robinson's most comprehensive and interesting. Mr. Robinson kindly contributed to the selection of the talks and interviews presented below. A much fuller list of interviews (video, audio, print) can be found here at KSR.info. Listed below are some Video, Audio and Print interviews. -- and an SFCD + KSR.info exclusive! Dr. Moira Gunn speaks with Kim Stanley Robinson, author of "Forty Signs of Rain" and "Sixty Days and Counting." They consider one scenario of what America would be like if global warming predictions came true.